We’d love your help. Let us know what’s wrong with this preview of The small BIG by Steve J. Martin. To ask other readers questions about The small BIG, please sign up. 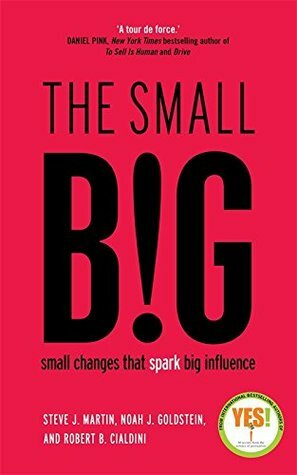 The Small BIG: Small Changes that Spark Big Influence is a pretty good book on the topic of ethically persuading people to change their behaviour. Grounded in research and mixing discussion with examples, the book intrigued me enough that I jotted notes and my own ideas as I read. This is pretty rare these days for me, and a sign of how engaged I was. Running quickly through my notes. Changing people's environment can change their minds. Context is important. Focus on similarities - shared identity The Small BIG: Small Changes that Spark Big Influence is a pretty good book on the topic of ethically persuading people to change their behaviour. Grounded in research and mixing discussion with examples, the book intrigued me enough that I jotted notes and my own ideas as I read. This is pretty rare these days for me, and a sign of how engaged I was. You can lock into other people's commitments (and the implication I took from this was that when companies ask us to filling surveys, they're not after feedback, but about the commitment we feel to the firm after we've committed our time via filling in the survey). When an expert is uncertain, that intrigues us. Power increases and our cortisol (stress hormone) levels decrease when we adopt open, expansive posture. Focus people on the opportunity cost of not doing what you want them to do. And the notes go on. I feel as though this book persuaded me to read it...touché persuasive book, touché. Small things can have big impacts. That's the theme of this book, and it largely delivers. We get 52 shortish chapters on a different aspect of persuasion. Like this ... people are more likely to give money to a hurricane disaster appeal if the hurricane has the same name as them. Or if the name of the hurricane begins with the same letter as their name. And to back it up each of these little nuggets is backed up with genuine research. Scientific research. By blokes with white coats and pens in th Small things can have big impacts. That's the theme of this book, and it largely delivers. We get 52 shortish chapters on a different aspect of persuasion. And to back it up each of these little nuggets is backed up with genuine research. Scientific research. By blokes with white coats and pens in their top pockets. It's well written, informative, credible. Unlike many of similar self-help books it doesn't take one little scrap of wisdom and blow it up into an entire book. There are slight niggles. For one thing the book is crying out for a summary. Each chapter heading is a question "What small change could achieve X and Y?". And while that makes for a teasing start to a chapter, it makes it difficult to find the nugget that you want. A simple list of the 52 ideas would be great (although it might remove the need to buy the entire book). One other niggle is that there is one example of schoolboy humour that ought to have been zapped in the edit. The footnote to chapter 7 doesn't add anything and will annoy some readers. Please delete it for the next edition. Recommended if you are in the business of trying to persuade people to do something. I have one hesitation. The science of persuasion is becoming more and more sophisticated. If businesses and politicians use these sorts of techniques, then we all need to know about them. Not only do we need to know how to use these techniques, we also need to be able to spot when they are being used against us. * Focus on finding uncommon commonalities to build rapport. Instead of asking someone's favorite TV show, ask for their top 5 and find the commonalities to get to more uncommon ones. * In BD, don't isolate your accounts to one point of contact; invite others in your firm to meet with accounts as new relationships further rapport than long time ones. * Ask recipients to signal (in email) by way of a simple "yes" response that the notes you sent are an accurate reflection of their understanding of next steps. Very useful book to read with applications in many aspects of life and business to make life easier by changing simply things. I just finished THE SMALL BIG yesterday and have already implemented one of the 52 ideas today. I have plans to use another idea later today, and I’ll still be implementing these ideas tomorrow and the next day. Here’s my advice: buy this book and keep it near your desk. Similarly-themed books feature studies done by other scientists—which is cool—but there was a surprising amount of research conducted by the authors themselves. The intimate feel of the self-conducted research and their writing m I just finished THE SMALL BIG yesterday and have already implemented one of the 52 ideas today. I have plans to use another idea later today, and I’ll still be implementing these ideas tomorrow and the next day. Here’s my advice: buy this book and keep it near your desk. Similarly-themed books feature studies done by other scientists—which is cool—but there was a surprising amount of research conducted by the authors themselves. The intimate feel of the self-conducted research and their writing made each small BIG feel approachable and applicable. There’s a plethora of journal studies conducted by other formable scientists, too. Each of the 52 chapters feature one-to-three studies each: all referenced in the back of the book. Every chapter is short (about three to five pages), making it perfectly digestible for reading a few a day. They are all outlined at the beginning so you can pick and choose what you think you’ll need. Some chapters build on each other; the authors do a great job of highlighting what you may have missed. Everything is covered from employee productivity to gaining effective online reviews. The writing is clear and concise. I would have liked more bullet-pointed features or bolding, such as their counterpart books offer, but the brevity of chapters and italicized subjects worked fine. The biggest issue I want addressed is the length of each study. For instance, one small BIG was to provide meaning to the task. The authors used a study where call center employees were given something to read that provided intrinsic motivation for the job. This group’s calls drew more donations compared to the control groups. However, what happens to their motivation over time? Would this approach desensitize if used daily over a month or a year? The authors include a final chapter showing how some techniques can be combined, while other combination effects could come across as gimmicky or un-authentic. That’s the catch of it all: knowing and implementing these tools without appearing as the stereotypical used car salesman. You know what I mean. Learn the tools of influence, but keep it real. You’ll sleep better at night. Whether you are the boss or the employee, the parent or the teacher, the neighbor or the friend, these are some great tools powered by the latest research that will surely benefit your life. Like I said before, keep this book at your desk and you’ll be using this tools today and tomorrow, too. Thanks to Grand Central Publishing for sending this book to me for review. Takes the principles of the book Influence by the same author (concerned with the science of persuasion) and presents them in 'bite size' chapters that explain how small changes can lead to big changes in results because of these principles (hence the title). The book is fairly interesting to read but I think Influence captures the principles better and makes a far more poignant and in depth case for how and why these principles work. Overall worth a read but I felt the small chapters don't reall Takes the principles of the book Influence by the same author (concerned with the science of persuasion) and presents them in 'bite size' chapters that explain how small changes can lead to big changes in results because of these principles (hence the title). The book is fairly interesting to read but I think Influence captures the principles better and makes a far more poignant and in depth case for how and why these principles work. Overall worth a read but I felt the small chapters don't really drive home why the principles work. I highly recommend Influence by the same author and for those that love that one I can recommend The Small Big, but if you were to read only one then definitely read Influence. An interesting and generally very practical book: 52 short chapters, each with a specific, straightforward, and tested, suggestion for how you might influence people to get a particular outcome. - Having problems getting people to attend their appointments for your clinic? Get them to write down the time and date on a slip themselves, or read it back to you over the phone - this improves rates over simply giving them a printed slip with the details. - Want to improve your own likelihood of goi An interesting and generally very practical book: 52 short chapters, each with a specific, straightforward, and tested, suggestion for how you might influence people to get a particular outcome. - Want to improve your own likelihood of going to the gym or remembering to meditate? Visualise the specific details of what you're going to do as you start the process, in advance of when you want it to happen. Better yet, write these details down in a short note to yourself. - Want to improve your tips as a server in a restaurant? Put a sweet or a mint on the tray with the bill for each person in the group - and then come back after a minute with another mint or two. And so on. Each chapter will only take you ten minutes to read, and although you may have come across some of the suggestions before if you've read the authors' other works, there will very likely be some that are new to you. And by the way, the authors are not science journalists, but are among the most widely recognised leaders in this field - Cialdini, for example, is the most referenced author ever in the field of social influencing. Do you already follow some of them? 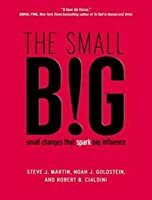 "The Small BIG" by Steve J Martin / Noah J Goldstein and Robert B Cialdini is an awesome read. There are 52 small changes mentioned in the book (perhaps one for a week) that you can bring in yourself or your environment to bring in extraordinary results in your life. You may be aware / may have read about some of these in one form or the other but I have listed 20 of my Book Lessons that influenced me sharply. The evidence of crowd following a specific thing is a big influencer to people behavior. Our behavior is largely influenced by the behavior of others around us. So, while selling a product, if you can highlight the number of positive feedback, reviews etc, it influences people to take a decision too. People who get influenced by the decision of the crowd often do not know or do not want to know the reason for their decision. More specific is the evidence, more is the probability of others to follow. It is advisable to give real time specific information when talking about any concept or product. People seek to define themselves based on what makes them unique. If possessing a specific product or a concept will bring people in a unique category, they are more likely to go for it. The Broken Windows phenomenon suggests the importance of keeping small things neat and tidy and how these positively influences others. Our own name is the sweetest word we hear. Use the recipient's name quite often in your communication with others to keep them interested in what you are trying to convey. You can persuade people by asking questions that plan and confirm their decision rather than a question which could confirm or negate a proposition. As an example, if you are pursuing a key person to attend a meeting, instead of asking 'Are you attending the meeting today? ', you might ask a confirmatory question 'What are you doing just before our meeting today?'. Whatever be the answer of the person to the later question, you have got a confirmation for the meeting in any case. You can lock people to commit to decisions by letting them know that the decision is implementable in far future rather than in the near future. This is especially true if they are not very sure of their decision today. Meaningful distractions for people waiting in queue can drastically reduce their frustration and improve loyalty. A circular seating arrangement nurtures collaboration while a square or rectangular seating arrangement promotes uniqueness and ownership. So, depending on the way you want to drive the meeting, you might choose an appropriate conference room. People expect experts to be certain about their opinions. But it is only when the expert expresses uncertainties that people are truly drawn into what they are saying. This is perhaps because they believe that no one can know everything, and an honest expression of uncertainty goes a long way in building the trust factor. People are proven to think more creatively if the room has a high ceiling or, even better, is an open lawn. So, it is not only you feel better in an open space, but also think better and more creative. Another reason, I should again start sleeping in an open terrace rather than an air conditioned room. Once again, it is proven beyond doubt. You can recollect all your power by writing down or visualising your powerful moments from past. There are no silly questions... Ask questions, ask help as often as you can. While negotiating, be the first one to place an offer and make sure that the offer is as precise as it is feasible. The first offer becomes the baseline and drives the entire negotiation discussion. When selling, don't just focus on cost savings for the client, but highlight what could potentially be done with the saved cost, thus leveraging the concept of Cost of lost opportunity, if the client does not go with you. When starting to chase goals, focus on the smaller achievements in the early phases (like 10% done rather than 90% remaining) and on smaller pending activities at a later stage (like 10% remaining rather than 90% done). This is called small area hypothesis and keeps you motivated towards your goal. Taking a physical step back and viewing the task from a greater distance can reduce your perception of how difficult the task of actually is. So, if you're stuck with a stubborn problem or are not able to take a decision, actually take a few physical steps back from the problem and re-think. Every experience has a 'peak-end' effect i.e. we tend to remember the peak experience and the end of the experience e.g. Remember one of your older vacation and you will realise that we remember usually the best / worst experience of the vacation and then how the vacation ended, completely forgetting the rest of the duration. This term is also called as duration neglect. So, to create better memories for your lifetime, you may reduce the number of days of your vacation but ensure that you have the thrillist adventure possible and wind it up with a great last day. Important is that all of these extraordinary results have been proven scientifically by more than one research and study. Go, pick your small change that can influence your results significantly. I listened to an audio version of this book. I want to buy the book so I can highlight parts. It had a lot of interesting ideas and insights. Probably most useful for people in larger companies but anyone can find things to use in it. I don't know if it was the person reading or the lame jokes the authors threw in from time to time but that kind of detracted from the book. One interesting part about the book is the many of the ideas were counter intuitive. Without reading the book, you might be d I listened to an audio version of this book. I want to buy the book so I can highlight parts. It had a lot of interesting ideas and insights. Probably most useful for people in larger companies but anyone can find things to use in it. I don't know if it was the person reading or the lame jokes the authors threw in from time to time but that kind of detracted from the book. This book contains a number of suggestions (all 50 of them) on how to effectively persuade others (ethically) with different ways. Each suggestion is presented in a short chapter with engaging stories. The key theme of the book (and hence the title) is that a lot of times, small changes and efforts can lead to big impacts. We need to be smart about it and look for the right idea to implement depending on our situation. I read this book as an audio book and will need to get back to it in an eBook This book contains a number of suggestions (all 50 of them) on how to effectively persuade others (ethically) with different ways. Each suggestion is presented in a short chapter with engaging stories. The key theme of the book (and hence the title) is that a lot of times, small changes and efforts can lead to big impacts. We need to be smart about it and look for the right idea to implement depending on our situation. This book is the latest on a series of three on the same topic. I feel like I should read the first two before reading this one, and I feel like there might be some repetitions along the way. What's appealing in this book is each chapter being concise and answering one specific question, so we can jump from one to another without a specific order. This isn't really a book, it's more a toolkit. There's lots of interesting human psychology principles, and if you enjoy behavioral economics you'll like this book. But it's a tedious read, one study after another, 53 in all. It's like they wanted to showcase every study that's ever been done. There's not enough theory, just studies and evidence. A very well articulated and backed by research book. You can adopt multiple techniques not just in your business but personal life as well. It requires more than a single read to comprehend the pool of thoughts this book has. A book of interesting ideas. Most of the proposed changes require little cost and potentially bring tangible benefits, whether they are big or small. However, as stated in the bonus chapter, a combination of maneuvers may not necessarily bring the desired effect. Practice with discretion. An interesting pairing. Having so recently read "Influence", there is a good deal of overlap. This is a much more practical book about how to apply influence well. I took quite a few nuggets away from this and can see how some of my current behaviors are actually anti-influential. Again, I didn't actually finish this because it was a book from my work and I quit my job, but I'm honestly not sure I would have finished it even if I had stayed. This book has a lot of cool little tidbits in it, but it's INCREDIBLY repetitive and just gets kind of annoying after awhile, honestly. Concise chapters on specific but simple changes that really do make a difference. Would have loved a summary for easy reference! Excellent book. Gives you very interesting insights on how small changes can bring about bigger changes in the results. I read this because I LOVE Influence by Robert B. Cialdini. This was an interesting book, but not as good (I thought) as Influence. I'm still glad I read it because I learned a lot. Ada beberapa model pendekatan untuk sebuah ajakan atau imbauan. Salah satu yang umum dipakai yaitu dengan cara menyampaikan sebanyak mungkin informasi atau gagasan terkait. Semakin kaya informasi, semakin kuat daya magis nya untuk mengajak (mempengaruhi). Pada akhirnya orang akan terpengaruh untuk mengambil keputusan. Namun apakah semudah itu orang lain akan mengikuti apa yang kita inginkan? Jawabannya tergantung dari konteks informasi yang di sajikan–terlepas dari faktor di luarnya. Mengingat Ada beberapa model pendekatan untuk sebuah ajakan atau imbauan. Salah satu yang umum dipakai yaitu dengan cara menyampaikan sebanyak mungkin informasi atau gagasan terkait. Semakin kaya informasi, semakin kuat daya magis nya untuk mengajak (mempengaruhi). Pada akhirnya orang akan terpengaruh untuk mengambil keputusan. Namun apakah semudah itu orang lain akan mengikuti apa yang kita inginkan? Jawabannya tergantung dari konteks informasi yang di sajikan–terlepas dari faktor di luarnya. Mengingat kita sekarang tinggal di sebuah lingkungan yang kebanjiran informasi dan stimulasi. Orang tidak bisa lagi mempertimbangkan semua informasi di tengah kesibukan, keterbatasan waktu dan berbagai hal yang menuntut perhatian. Peningkatan jumlah informasi yang telah kita miliki bukan jaminan menghasilkan keputusan yang lebih baik. Bahkan kecil kemungkinan untuk menggunakan seluruh informasi yang kita miliki tersebut. Akibatnya keberhasilan membuat keputusan atau mempengaruhi orang lebih ditentukan oleh konteks dan lingkungan psikologis, tempat informasi di sampaikan. Bukan semata–mata pada kognisi saja. Yang hanya terbatas pada pemberian informasi agar orang lain terpengaruh dan mau berubah. Hingga kini kita bisa melihat bahwa orang tetap bisa dipengaruhi oleh perubahan–perubahan kecil dalam konteks komunikasi. Sebagaimana nenek moyang kita sejak ribuan tahun silam. Buku ini menyajikan pendekatan berupa perubahan–perubahan kecil, mengenai informasi yang akan kita sampaikan kepada orang lain. Yaitu mengaitkan pesan dengan motivasi yang di rasakan oleh orang lain. Perubahan kecil di petakan agar informasi yang disampaikan nantinya secara dramatis dapat diterima dan dilaksanakan. Tentunya tanpa memakan banyak biaya, waktu maupun tenaga. Gagasan perubahan kecil yang diajukan berdasar pada riset para ahli di bidang ilmu persuasi. Yaitu untuk menunjukkan perubahan kecil apa yang berakibat besar dalam berbagai situasi. Prinsip umum persuasi yang digunakan adalah; timbal balik (kita merasa wajib membalas kebaikan orang lain), otoritas (kita mengharapkan bimbingan dari para ahli), kelangkaan (semakin sedikit suatu sumber daya, kita semakin menginginkan), kegemaran (semakin kita di cintai, orang akan semakin mengiyakan kita), konsistensi (kita cenderung bertindak konsisten dengan komitmen dan nilai), dan bukti sosial (kita cenderung melihat apa perilaku sesama dalam melakukan tindakan). Penelitian di bidang ilmu neurosains, psikologi kognitif, psikologi sosial, dan ilmu ekonomi perilaku telah mengungkap pemahaman lebih luas tentang bagaimana terjadinya pengaruh, persuasi dan perubahan perilaku–turut disertakan pula judul jurnal rujukan yang berkaitan. Dengan disajikan dalam bab–bab pendek, lebih memudahkan kita dalam memahami mekanisme psikologis pada setiap problem yang di tampilkan. Berbagai bidang disinggung dalam uraian buku ini. Mulai dari hal–hal dalam bisnis dan pekerjaan, kesehatan, motivasi dan pengembangan diri hingga komunikasi yang terkait dengan keseharian. Sehingga mudah di terapkan (dikembangkan) bagi siapapun. I like reading books about persuasion to help me be more conscious of the ways advertisers and politicians manipulate people. To that end, this book didn't have much new information. But something I really liked about this book was that it heavily focused on how to get people to do things that are good for them or the greater good. It wasn't all business all the time. There were even tips in here on how to trick yourself into doing things that are good for you that you're likely inclined to avoid I like reading books about persuasion to help me be more conscious of the ways advertisers and politicians manipulate people. To that end, this book didn't have much new information. But something I really liked about this book was that it heavily focused on how to get people to do things that are good for them or the greater good. It wasn't all business all the time. There were even tips in here on how to trick yourself into doing things that are good for you that you're likely inclined to avoid. There are almost too many case studies in here to make his feel very in-depth. However, it's useful as a workbook or exercise. Using it as a companion to my work sheds new light on some persuasion already in play. Steve J. Martin is the co-author of the New York Times International bestseller Yes! 50 Secrets from the Science of Persuasion. His work in the field of persuasion science has featured widely in the media. His regular business columns for the British Airways in-flight magazine and the Harvard Business Review are read by over 2 million people each month. He is a guest lecturer at the London Busines Steve J. Martin is the co-author of the New York Times International bestseller Yes! 50 Secrets from the Science of Persuasion. His work in the field of persuasion science has featured widely in the media. His regular business columns for the British Airways in-flight magazine and the Harvard Business Review are read by over 2 million people each month. He is a guest lecturer at the London Business School and the University of Cambridge.